Posted September 20th, 2018 & filed under News. 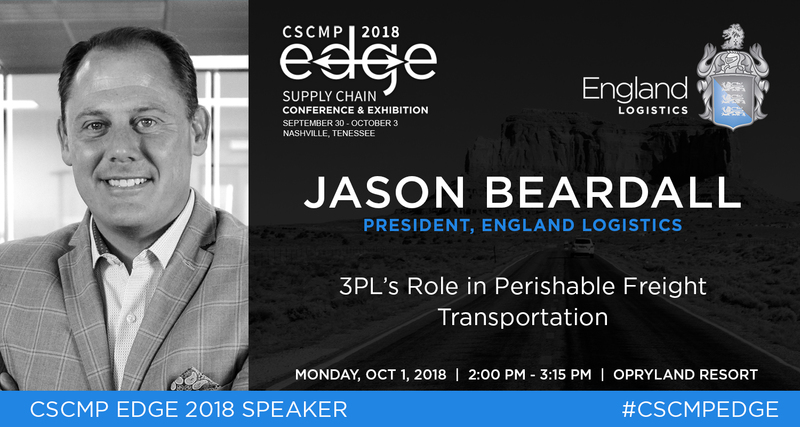 SALT LAKE CITY, Utah, September 1, 2018 – Jason Beardall, president of England Logistics, will present at the Council of Supply Chain Management Professionals’ (CSCMP) 2018 EDGE Supply Chain Conference & Exhibition in Nashville, TN. His presentation, titled “3PL’s Role in Perishable Freight Transport,” will take place Monday, October 1 from 2:00 – 3:15 p.m.
Utilizing England Logistics’ experience as one of the few third-party logistics companies to offer a supply chain management service, Beardall will discuss strategic supply chain management as well as overseeing perishable freight. Beardall will present alongside Kerry Byrne, president of Total Quality Logistics; Mike Riccio, CMO of Leonard’s Express; and Geoff Turner, CTB, president and CEO of Choptank Transport, Inc.
With presentations from a variety of industry leaders, CSCMP Edge offers insight into best practices for logistics and supply chain companies. This annual conference will host over 3,000 supply chain practitioners and feature over 100 sessions as they discuss innovative strategies to enhance supply chains. For more information, please visit eiseverywhere.com/ehome/cscmpedge2018/2018Nashville/. England Logistics offers a vast portfolio of non-asset based transportation solutions including full truckload services, intermodal, dry and cold chain LTL, parcel, global logistics, and complete supply chain management. England Logistics is an equal opportunity employer offering competitive national and international opportunities to qualified candidates. Headquartered in Salt Lake City, Utah, the company also has offices in Atlanta, Georgia; Detroit, Michigan; Greeley, Colorado; and Portland, Oregon. To become part of England Logistics’ freight agent team call 866-476-7012 or visit http://www.englandlogistics.com.